Super strong air retention barrier bubbles are designed to protect against vibrsation and impact. Available in retail designed bags or dispenser boxes. 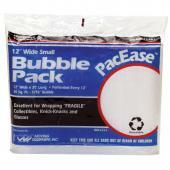 Bubble wrap perforated every 12″ for easy use.